The athletes in this years Oregon Ducks recruiting class are shaping up to be a rather unique bunch; including a pair of twins and a pair of players who are the sons of former NFL players. Now with committed running back Thomas Tyner and the addition of Devon Allen, the Ducks have a pair of the fastest high school sprinters in the country. 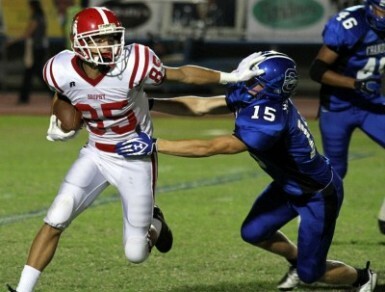 Devon Allen, a 6′-1″, 190 lb. receiver from Brophy College Prep in Phoenix, AZ, said recently that he wanted to find a school that offers him the best in both football and track and field. As it turns out, there seemed to be but one option for him. Devon’s opportunity to become a Duck was recently rewarded with the offer of a football scholarship from head coach Mark Helfrich. That offer was quickly accepted. Just how fast is Devon Allen? Consider this — last spring at the Arcadia Classic in California he won 3 individual events and 2 relays on one weekend. In his three individual races, the 200m and 110 and 330 hurdles, he posted marks that were all ranked in the top 5 in the United States. Not long afterward, Allen was named the ESPN’s Gatorade State Boys Track & Field Athlete of the Year for the State of Arizona. The award is given based on athletic production, high academic achievement and exemplary personal character. Yes, Devon Allen, like so many Duck Recruits these days, is a model citizen, and he sports a 3.60 GPA. Allen is a young man with high goals. He recently told Jared Cohen of Pros2Preps that his Senior year goal is to set the national record for the 110 hurdles and the 200m sprint. What helped Devon make Oregon his final choice? Undoubtedly, it was the quality of the track and field and Oregon football teams. Beyond that it also turns out that the transfer of Oregon QB Bryan Bennett had a lot to do with the offer of a football scholarship to Allen. Allen had been told by the Oregon football coaches that there were only two scholarships available for receivers and that both were filled. He was also told that if any players were to transfer he would be the first in line for the opening. True to their word, Allen received a call the day after Bennett announced that he would be leaving to transfer. So while it is obvious that Allen has great potential as a track athlete, how is he expected to do as a wide receiver? While no recruit is a sure deal, the chances of Allen becoming a major contributor are there. Why? Well for one he is fast — very fast; fast enough to give De’Anthony Thomas a run for his money. There is always room for a really fast receiver that can stretch the defense, creating opportunities all over the field. Allen has also shown the he can catch the ball, which will be requisite with any Duck receiver. In the recent Semper Fidelis All-American Bowl on January 4th, Allen pulled down 6 receptions; one of them being a touchdown. That leaves blocking and route running. Allen is an aggressive blocker, showing the desire to stay on his block all the way though the end of each play. Most impressive could be Devon’s precision pass routes. He makes them look effortless in the same way he does when running the hurdles. It should not be a surprise; running hurdles requires strength, flexibility, precision and an attacking mentality. It requires precision in the steps between hurdles and efficiency in technique to clear the hurdles with the minimum loss of momentum. All are similar attributes required to become a good receiver. I suspect Devon Allen will be one of the better route runners that have taken the field in recent memory for the Oregon Ducks. Why is that so important? Well, for one it requires good foot work that makes it difficult for a defender to cover when in man coverage. It also helps the QB a great deal to know that his receiver will reliably be in the right spot at precisely the right time. You can see both of these qualities in the video below. Watch Devon Allen’s footwork and the problems it causes for the defenders. We’ve seen plenty of highly rated recruits not pan out; however, you needed the highly rated recruit to begin with for the ones that do work out. 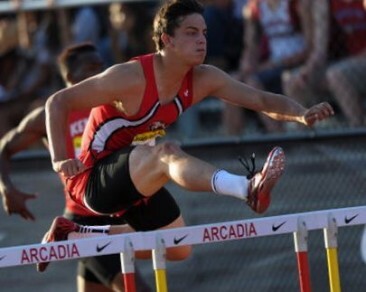 Given the high degree of talent that Devon Allen has in football, and the world-class talent he has in track, it’s difficult not to imagine a successful career ahead of him as an Oregon Duck!